For more than 50 years, guests and employees at Unity Village enjoyed the cool, refreshing beauty of the long reflecting pool and its spectacular fountains at the heart of Unity School of Christianity near Kansas City, Missouri. In 2003, a portion of the central fountains collapsed. The waters were still and the reflecting pool remained empty, awaiting restoration. 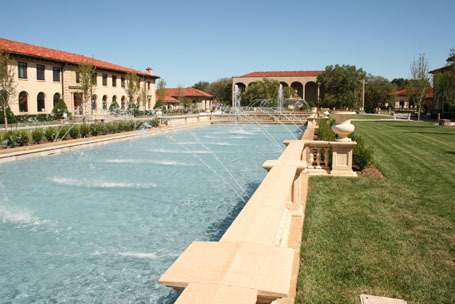 In 2007, Counsilman-Hunsaker was retained to provide aquatic design services for the fountain renovation. The restored fountains now consist of arching jets that extend from the corners and converge in the center. The restorative effort of the main lineal fountain body consists of an entire perimeter of symmetrically arranged arching water from both sides that meet at the exact center of the fountain, forming a diamond. The elevation of the jets forms a perfect colonnade on either side of the fountain, leading visually to the central piece of the fountain – “The Bridge of Faith.” Beyond the extents of the main fountain feature lie two mirror pools, one at either end. The restorative renovation includes all new equipment and entirely new interior finishes on the fountains. In addition to the flowing fountains, large flowering urns, ornamental lighting, and pathways of engraved brick pavers also grace the courtyard. Long rows of mature columnar maple trees run the length of the fountains, adding bright hues of orange and red each fall.